The term ‘bargain’ has the word ‘gain’ embedded in it. This itself can enthuse people to seek a bargain. But then, how do we find a bargain? Is it by chance? Or does it involve meticulous study? All investors would be keen to have answers to these questions so that they scale the pinnacle of success through their most profitable and the best long term stock market investment strategy. Well, bargain per se, is the process of understanding the difference between the price and the value of a product. Let us look at an example for understanding what a bargain is all about. A roadside shop sells old and not so new books. Customers seeking to purchase books which are otherwise priced high at normal bookshops find this shop useful. The buyer has a fair idea about the price. The value of the book as perceived by the customer may far exceed this price and this is where the bargain lies. 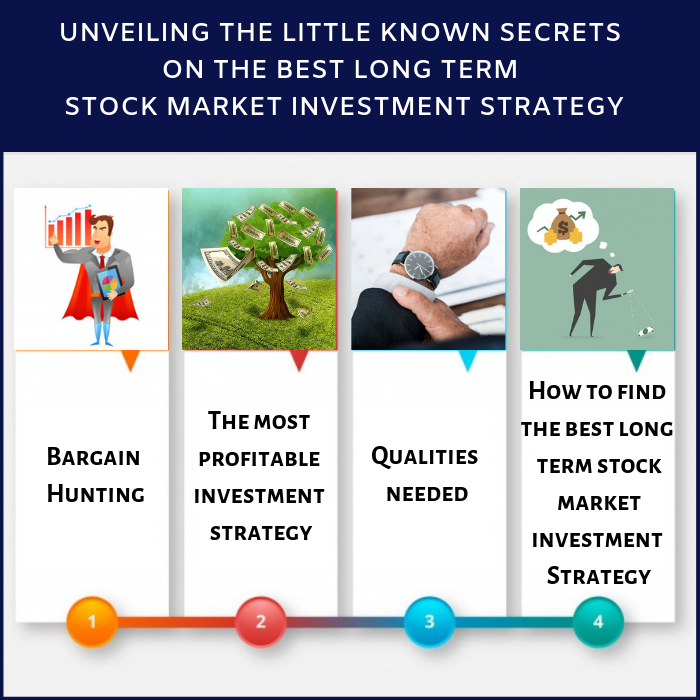 How to find the best long term stock market investment Strategy? It is obvious that in order to find a bargain one has to acquire knowledge regarding the price and the intrinsic value. So how does the investor start about gathering the required information? To start with, the investor can draw up a list of potential investments. Next he can research and seek advice from people of knowledge so as to form sound estimates regarding their intrinsic value. He can also develop a sense of how large or small the margin of safety is in regard to price. Last but not the least an understanding of the risks involved with each or the correlation among the various asset classes is also an essentiality. The essence of finding a bargain is in having more knowledge and information than others regarding the potential of a particular investment. thus investing in such technology is a boon. It is likely that a lot of people would not be aware of such implications. B) Fundamentally questionable on the surface: There are things which “look good from far but are far from good”; similarly there are stocks which apparently do not look straight but could be potential gold mines. A live example could be a stock which has traded below its intrinsic value for some time and does not look attractive to the buyer for any reason which does not have any relation to its worth. C) Controversial, unseemly or scary: Many a times we come across companies which are doing well, have a fair reputation and have also kept investors satisfied with their results. Suddenly a litigation or a hefty penalty is imposed by state and government authorities which may on the outside seem to be destabilizing for the company. The investor could get scared under such situation but perhaps a better scrutiny of the company’s balance sheet will reveal that the eventuality has already been provided for in the books and hence there is nothing to worry about. D) Deemed inappropriate for respectable portfolios: The stock portfolio which we put together often reflects our personality. Seasoned and respectable companies with a stable record over many years may be the core of our portfolio and suddenly purchasing the stock of a small information technology company which is making waves may not seem to be a respectable option. However, being more flexible and intuitive actually helps to broaden the horizon of the portfolio. Finding bargains and adopting a defensive stock market investment strategy may not seem to go hand in hand, at least on the surface. There are in fact many types of investors,- the really aggressive ones who believe that ‘offense is the best defense’, the cautious ones who like to consult, read and weigh the pros and cons before committing an investment. There are also those who exist in between this continuum and the defensive investor is one of them. Consistency and disciplined approach are the keys to a good defensive investment strategy. Let us look at an example from the sport of cricket to understand what a ‘defensive approach’ is all about. In cricketing parlance there is a term ‘controlled aggression’. It is about being sound in technique and being dogged in defense so that a really difficult ball is kept down with a straight bat. Good batsmen are always on the lookout for opportunities to score; he waits for the loose ball from the bowler and then sends it soaring into the fence for a six. Investors can also take a lesson or two from the game of cricket and play the game of ‘controlled aggression’. Just as in the case of the cricket, batsmen taking undue risks can bring about their downfall, investors too, need to use their judgment (acquired through experience and knowledge) to keep out the ‘bouncers’ and ‘googlies’. Everything in the financial world is like a double-edged sword, one edge attempts to maximize profits, while the other leads to an exposure to greater risks. The choice has to be made, whether to go in for higher returns and thus invite more risks, or seek safer options and earn average returns. It is definitely advisable to think long term and not focus only on short-term gains. Patience and persistence are two hallmark qualities in defensive investors. It is important to remember that in the financial market there are elements which are either not known or even if known, cannot be changed. It is ‘the slow and steady” who usually wins the race and even if this may seem to be a very laid-back effort, the truth is that it is ‘better to be safe than sorry’. The general investor should look to invest according to his profile and propensity to take risks. Finding a bargain can be achieved not by chance but by perseverance and through overall awareness about the market. Defensive investing is not a negative form of investment; rather it is an iteration of consistency and discipline.